Discover French Rosé — plus an authentic paella recipe from the South of France! When a wine isn’t quite red, it’s rosé. This pink-tinged beverage is made using red grapes, but with a different process than used for creating red wines. The most common technique for making dry (not sweet) rosé wines is limited maceration. The red grapes are pressed just until the juice has the desired color. Once that color has been attained, the winemaker stops pressing and separates the juice from the skins and pulp, transferring the juice to another tank for fermentation. Other rosés are made with the saignée [pronounced sahn-yay] or “bleeding” process, in which the juice is obtained by piling the red grapes in a tank and letting the grapes’ weight do the crushing. The lightly colored juice is pulled out and fermented. Lots of different red grapes can be used to create rosé: Grenache, Cinsault, Cabernet Sauvignon, Pinot Noir. If it’s a red grape, it’s probably been used to make a rosé at some point. The center of the rosé wine world is in France, in particular the South of France. There, along the sparkling Mediterranean, varieties like Grenache, Syrah and Carignan are blended to make delicious and strawberry-inflected dry rosés. Other regions in France producing tasty rosé are Bordeaux (made from Cabernet Sauvignon, Merlot or Cabernet Franc) and the Loire Valley (typically made with Cabernet Franc). One of our favorite rosé producers is Michel Gassier, located in Costières de Nîmes, in the heart of Provence. 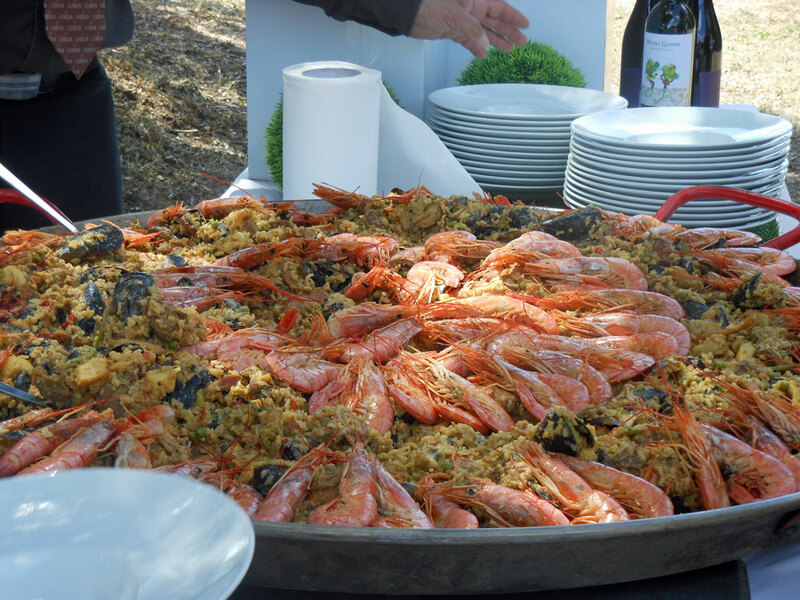 Our team recently visited proprietors Michel and Tina Gassier, where they treated us to an incredible spread of paella washed down with copious amounts of their fresh and delicious rosé. Take a look at a past spotlight on Michel and Tina here. We loved the paella so much that we asked for the recipe, and Tina was kind enough to share it with us. An authentic paella is often prepared over an open fire. When we do our paella, we grill it over hot coals from grape vines in a paellera (a special shallow pan that allows the rice to cook evenly) – but it can be done on a barbecue with great results. The key to a paella is the rice – it should always be a short-grain rice. The Spanish version is called Bomba, but Italian Arborio rice is a good substitute. Whenever using saffron threads, it’s best to first crush the threads, then soak them in a small amount of hot broth for 15 minutes. Red peppers and peas are never cooked in the paella, but grilled red peppers and steamed peas can be added once it is cooked. Shell and devein the shrimp. Cover and refrigerate the shrimp and save the shells. For the next few steps use the same skillet without cleaning it – each flavor adds to the next. In a large skillet, heat 2 tablespoons of oil and sauté the chicken thighs and drumsticks, turning once, until golden brown (about eight minutes). Remove the chicken from the skillet. Add the chorizo and sauté for 2 minutes. Remove the chorizo. Add the shrimp shells and sauté the shells until they turn pink, this contributes lots of shrimp flavor. Discard shells. Add half of the mussels in the skillet along with 1/2 cup water. Bring to a boil while stirring constantly. Remove the mussels as they open and set aside. Now add half of the clams and proceed the same way. Remove the clams as they open and set aside. While the broth is still hot, soak the saffron threads in a small amount of the broth for 15 minutes and then add it to the rest of the broth. Let cool, then refrigerate. Once the shellfish has cooled, reserve the meat from the mussels and clams, cover and refrigerate, and discard their shells. In the morning, bring all of the ingredients to room temperature. Mince the garlic, parsley, thyme, paprika and a pinch of salt together in a food processor. Slice the onion thinly, cube the green pepper and skin and finely chop the tomatoes. Combine the broth, the clam juice and the white wine, add salt if necessary, and bring to a simmering heat. Set up your outside grill. When the coals are good and hot, heat 2 tablespoons of the oil in a skillet or shallow casserole you can put directly on the grill and quickly sauté the shrimp for 1 minute. Remove the shrimp and keep close to hand. Add 6 tablespoons of oil to the skillet. When hot, mix in the onion, green pepper and tomatoes as well as the garlic mixture and stir well and cook over the grill until the vegetables are slightly softened. Stir in the rice and coat well with oil and vegetables. Add enough hot broth to just barely cover the rice. Stir the rice. Add the chicken, chorizo, the meat from the opened mussels and clams, stir well and add enough broth to cover. Continue to boil, stirring occasionally, until the rice is no longer soupy but sufficient liquid remains to continue cooking the rice. Add more broth if necessary. Arrange the shrimp and the remaining uncooked mussels and clams “hinge up” over the rice. Cook uncovered for about 20 minutes – the rice should be almost but not quite done. You can now decorate with strips of grilled red peppers and peas, if you like. Remove the pan from the fire and cover with foil. Let sit 5-10 minutes until the rice is cooked to taste. Garnish with lemon wedges and serve. Thank you so much for posting this! The paella looks just heavenly! I would have to agree that a French dry rose is such a wonderful way to experience another side of red wine grapes (and yes, one of my favorites is a grenache rose). I look forward to trying the paella, and learning more about Chateau de Nages and Michel Gassier. Sante!